London Explorer Pass at the Best Price! Buy the London Explorer Pass at the best price with promo codes and tips for online deals. It is so easy to get a discount and to save some Pounds with these working codes & tips! Read the following questions & answers to this topic and learn how to get some discounts and how high these could be. If you are in hurry just click here to find the some valid promo codes. Where can I find the latest promo codes and how do I use them? What discounts are available for the London Explorer Pass? How can I get a special price for the London Explorer Pass if there are no promo codes available? When and how often is there a website sales campaign directly from the provider? Where can I subscribe to the newsletter and what are the advantages? Should I buy the London Explorer Pass online before my trip starts? Which methods of shipping are available for online orders? Where can I find the latest promo codes and how do I use them? After you have entered the promotion code and clicked on -APPLY CODE- you will get a message and see immediately how much discount you will receive. Unfortunately, the price value in the shopping cart will not be updated. If you change the shipping method and with that the total price in the shopping cart you will see the discount prices there. Do not forget to re-adjust the shipping method according to your needs. ATTENTION! Be cautious if there is a website sale. Discounts will not be summed up. You will receive in any case the discount from the promo code, even if the result is a higher price. In order to ensure a correct function of the codes, please click on the button -Website- in the list below to get to the provider website. What discounts are available for the London Explorer Pass? The following table shows for each standard price the possible discounts with the reduced prices for the various sales deals. ¹) The indicated prices and discounts are only guide values and may change at any time. There is no warranty for completeness. If there is no website sales campaign* available at the moment, then a promotion code is the fastest and easiest way to get a special price. If there is also no promotion code currently available, you will have another option to get a discount. With the help of a newsletter registration you will usually receive a personal promo code and will also be informed about website sales campaigns. Read the next questions and answers to find out more about the different discount possibilities. How can I get a special price for the London Explorer Pass if there are no promo codes available? If you want to buy the pass right away, you can check whether a website sales campaign is running. You may also receive a special price immediately if you sign up for the newsletter from the provider. Unfortunately, this is not always the case. Sometimes it takes a few days until you get a personal promotion code. When and how often is there a website sales campaign directly from the provider? Currently there is very seldom a sales campaign on the provider website*. During such a campaign you will get a special price with at least 5% discount and it lasts for a few days. Unfortunately the campaign dates are always different and therefore it is not possible to predict it. By signing up for the newsletter you will usually receive a message when a website sale starts. So you do not have to visit the website regularly to check for a current sales campaign. Where can I subscribe to the newsletter and what are the advantages? On the bottom of the provider website* you will find the sign up box for the newsletter. You just have to enter your e-mail address and normally there is no confirmation mail for the registration. If a newsletter campaign is currently running you will receive immediately a reduced price. Otherwise you will have to wait usually 2 days before you receive the first e-mail with some information about the pass. In most cases you will receive a message with a personal promo code for 5% discount approximately 2 days later. After that, you will receive further e-mails with general information and also news about current sales campaigns. 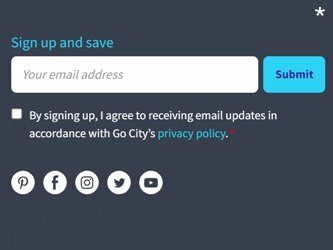 Of course, you are able to unsubscribe from these newsletters at any time. All you have to do is click on the text -Unsubscribe here- in one of the received e-mails. Should I buy the London Explorer Pass online before my trip starts? Most of the time you will only get a discount price if you buy online and you will have to pay the higher standard price on site. Since the pass is valid for 1 year from the date of purchase, you stay flexible despite ordering online. However, if you do not want to take any risks, do not buy the pass more than 30 days in advance of your travel date. You have the possibility to cancel your purchase by mail for up to 30 days. More information on this can be found in point 3 of the terms and conditions*. Which methods of shipping are available for online orders? Beside the usual available chargeable delivery, you have also the possibility to choose a free pick-up of the pass from a ticket counter. The counter is located in the center of London and is open daily. All who own an iOS or Android smartphone may also choose the most comfortable option, the Mobile London Explorer Pass*. Then you can easily visit the selected sights just with your smartphone.